Malik, who turns out to be a great, stoic little kid by the way, is used to reading between the lines when it comes to negotiating the adult world. After all three generations of the family live in rather cramped quarters, and Malik, who’s a quiet child overhears things he’s not supposed to. For example, the father of his best friend was taken away “by men in leather coats,” and the family even holds a funeral with a empty coffin at one point. Malik learns that some things happen but are never discussed, and while he rolls with seemingly bizarre events, he doesn’t fully accept some of the lies he’s told. Eventually Malik and his family move from Sarajevo to the remote wetland area of Zvornik in order for Mesa to undergo “resocialising,” and throughout the film, we see a number of family events: a wedding, a circumcision, and a funeral which display the culture which is inevitably impacted by the totalitarian state. The film makes it clear that normal, robust family life is not suppressed by the totalitarian state but only complicated by it. There are a couple of scenes in which Mesa is called in for questioning–once in Sarajevo and once in the remote area of Zvornik. Both times Mesa is questioned there’s rather interestingly no torture, but then again there’s no need for it as Mesa has already been judged by the bureaucratic powers. In both scenes circulating fans act as symbols of the totalitarian machine with the power to blow people’s lives apart. 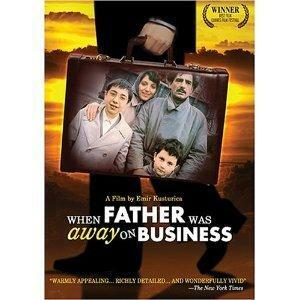 When Father was Away on Business is both an excellent and seminal film for its low-key portrayal of a difficult time in Yugoslavian history, and for the way in which the film adroitly depicts the interference of the totalitarian state in the lives of ordinary people. Mesa’s behaviour, after all, is a matter for his wife–not a concern of the state, and so ultimately the film shows how the abusive state interferes in private lives for the flimsiest of excuses.